Ahead of the Super Tuesday presidential primaries, we at CatSynth will try to virtually visit many, though not all, of the states involved. We begin in the Northeast Kingdom of Vermont along State Highway 114. It winds its way from the most remote northeastern corner of the state and The Kingdom State Forest eventually into the towns and lakes of the region. The scenery as seen in images often is lush and green, when it isn’t brightly colored in the autumn. It is not surprising that the Green Mountains and the state of Vermont were given their verdant names. It’s also interesting to note how different the terrain and scenery is from neighboring New Hampshire. As a reader noted in our New Hampshire edition on DailyKos, the Connecticut River that divides the two states also separates radically different geological structures between the Green Mountains of Vermont (an extension of the very old Appalachian Mountains) and the younger, rockier mountains of New Hampshire. The geography lead to very different settlement patterns, different economies (farming in Vermont versus industry in New Hampshire) and perhaps into the modern political contrasts as well. In terms of life in The Northeast Kingdom, I often turn to the blog meeyauw, who has over the years mixed great photography from her nearby landscape with cats and mathematics. I did enjoy these recent pictures from the author’s home near Barton Mountain, not far from Highway 16. We can follow VT 16 back to Interstate 91, the main highway in and out of the “The Kingdom”. Heading south on I-91, the terrain looks a lot like eastern New York, hilly and forested. We turn off the highway onto US 2 and head west to Montpelier, the state capital. It has the distinction of being the smallest state capital in the U.S. It is in Montpelier that we turn onto Interstate 89, which crosses the state diagonally from New Hampshire in the southeast to the Canadian border in the northwest. Along the way it connects the capital to the largest city, Burlington. Although I-89 never enters the city, it is easy to connect to the downtown via US 2. Probably more than any other place in Vermont, Burlington defines the state’s current political reputation. It is home to Bernie Sanders, onetime socialist mayor of the city and current U.S. Senator. We at CatSynth have long been fans of Sanders, not only for his political views but also his strong Brooklyn accent. Burlington is also the birthplace of Ben and Jerry’s Ice Cream. The city itself is on Lake Champlain, and one can look out from its waterfront across the lake to New York State. Lake Champlain contains several large islands, particularly in its northern half. US 2 traverses most of these, including Grand Isle via a network of bridges and causeways before heading west at the north end of the lake, where Vermont, New York and Quebec all meet. From Vermont, we jump to Virginia, the other state that begins with the letter “V”. 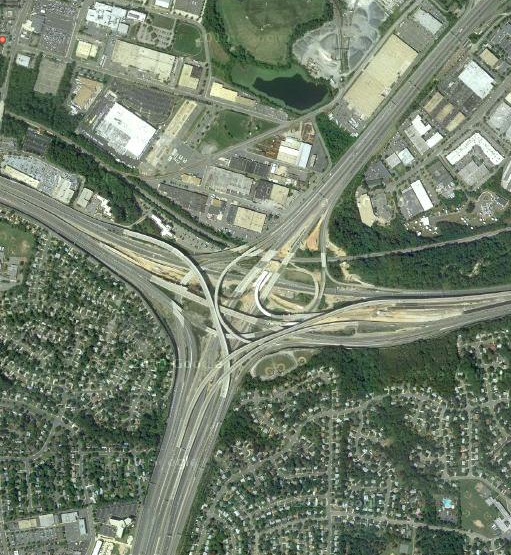 We begin just south of Washington, DC at the notorious Mixing Bowl Interchange. The Mixing Bowl, also known as the Springfield Interchange, connects I-95, I-495 (the Capital Beltway) and I-395. The latter heads north into the center of Washington DC, while I-495 casts a wide circle through the suburbs. The interchange is complex-looking enough and well-known enough to have even gotten its own “Fun with Highways” article back in 2009. While the interchange in its current configuration is complicated, the aerial view is even more so because of the “ghosts” of ramps that were removed during a massive reconstruction project. We can stay in Virginia on I-495 heading “west” (though what is west on a circular highway?) and turn west on I-66. The highway is quite crowded in the growing suburbs of northern Virginia, but starts to quiet as one moves westward. Along the way, one passes Bull Run and Manassas of Civil-War battle fame. There was not one but two major battles here. I am pretty sure there are more Civil War sites in Virginia than any other state, and many in the northern part of the state like Manassas are likely getting absorbed into the expanding suburbs. I-66 continues west towards the Appalachian Mountains, specifically the Blue Ridge Mountains that form the eastern edge of the range. Before its end, we can turn southward to Shenandoah National Park and tour the Skyline Drive. Skyline drive runs for 105 miles and offers spectacular views of the mountains. I have heard (and seen photos) that suggest it can at times get quite foggy as well, though. Nonetheless, doing the entire drive seems like it would be rewarding if one is not in a hurry. In addition to the views, there are details such as the rather narrow Mary Rock Tunnel. The southern end of Skyline Drive connects to I-64. One can head east towards Charlottesville, home of the University of Virginia and one of the country’s shrines, Thomas Jefferson’s home Monticello. The geometric aspects, symmetries and design are quite interesting, as are some of the inventions and features inside. One can tell it was a labor of love (and obsession) for its owner. For some reason, one thing that stuck with me when visiting is the idea of “a home within a home”, a much more modest actual living space almost self contained within the grander designed building. Back on I-64, we can head west onto Interstate 81 which runs along much of the Appalachian Mountains. It passes through hills, valleys and towns along the way, and is indeed a major corridor for the interior eastern US, connecting the northeast with the south. As such, it connects to our next state. We continue on I-81 into Tennessee, where it ends at I-40. Here we leave the interstate and head south first on TN 66 and then US 441 to the Great Smoky Mountain National Park. It has the distinction of being the most visited national park in the U.S. It offers great views of the southern Appalachian mountains, both scenic vistas of the mountains and details such as streams and waterfalls. The other thing I remember from a visit as a teenager was encountering black bears. Even as one is cognizant of the fact that the bears are potentially dangerous wild animals, there is something quite endearing about them. We did also go to the top of Clingman’s Dome, the highest point in the Smokies and the highest point in Tennessee. We can west from the park on US 441 to the city of Knoxville. I do like the Sunsphere, though it looks quite out of place, a future retro design from a past era (or maybe a disco ball). It’s the sort of thing one expects to see abandoned as in the New York Worlds Fair, in a delightfully dystopian setting like Alexanderplatz in East Berlin. However, the Sunsphere sits in a well-maintained green park and has been reopened with an observation deck, cafes, and what I am guessing must be quite unique office space . Continuing westward on I-40 through the state, our focus shifts to music. Nashville is of course a major music-industry center, both in terms of records and musical instruments, and is synonymous with country music (though in fairness the city is home to other types of music as well such as alternative rock). But I think I would identify more with its neighbor to the west, Memphis. Memphis is home to important early blues, but I think it is the later Electric Blues, early Rock-and-Roll and Memphis Soul (as epitomized by Stax Records) that most interest me – even as a mostly “experimental” composer, the sounds of these genres are a strong influence. I can’t personally speak to an I-40 musical rivalry between Nashville and Memphis, but perhaps some readers may be able to contribute here. Indeed, I-40 is named the “Isaac Hays Memorial Highway” on its eastern approach to Memphis. Long before he was Chef on South Park, Isaac Hays was a leading figure in Memphis Soul on Stax. I-40 and I-240 together form a beltway around this city’s outer neighborhoods, but its downtown and many of its most famous landmarks lie further west, between I-240/I-69 and the Mississippi River. Just off this highway south of downtown is the Stax Museum on McLemore Avenue. Further north on off I-240/I-69 is large exit for Union Ave, which carries several number designations all at once (US 51/64/70/79). 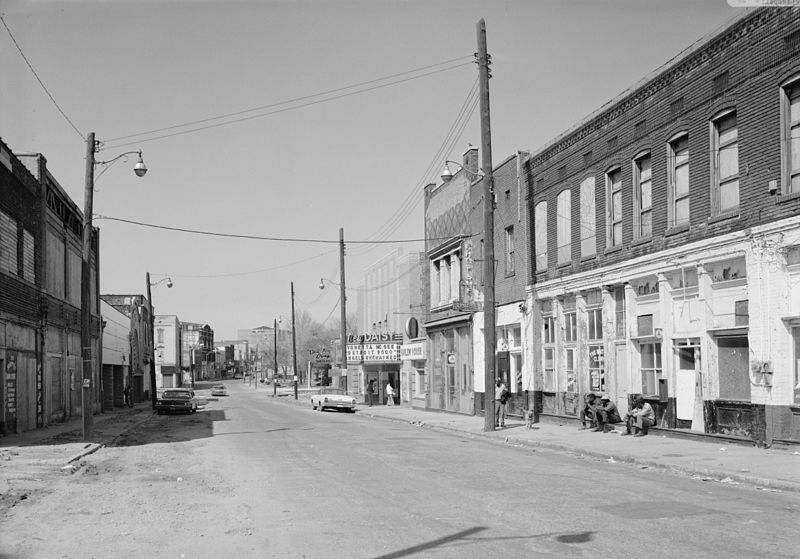 Union Avenue was once home to Sun Records which produced many of the earlier Rock-and-Roll artists of the 1950s. Union Avenue also provides access to Beale Street. It is a major tourist destination now with blues clubs, based on its historic significance in the development of the music. But it did go through a rough period before it was revitalized as the original music industry and the area in general went into decline in the 1960s. Consider this picture. The Daisy Theater is still visible, but other than that the street looks run down – but somehow “authentic.” It is perhaps best to think of the new revitalized touristy street as just another phase of its history. Because we are attempting to visit many states at once, each one will inevitably get less attention (this is true of the political process that is happening in parallel). As always, it is great to get feedback and ideas of places we missed. So please don’t be shy about leaving us your comments. In tomorrow’s installment, we will explore a few more states, in particular Ohio and Idaho.